This is an invaluable addition to the �Walton conducts Walton� discography. In the 1950s Walton made a series of classic recordings of his own works in collaboration with Walter Legge and EMI. The recordings of the First Symphony and Belshazzar�s Feast more or less hold their own today, unless absolutely modern sound is required - the 1951 symphony recording, is of course, mono only. The relationship between composer and producer cooled somewhat in the early 1960s and, after suites from Henry V and Richard III, the project was discontinued. However, Lyrita enterprisingly tempted Walton back into the studios a decade later to record the works on this disc. 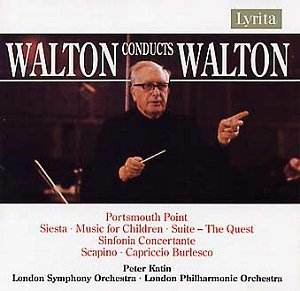 What is apparent right from the opening of Portsmouth Point is that Walton�s own conducting had become rather more sluggish during the intervening years. Anyone expecting the gripping electricity captured in the 1950s recordings should probably look elsewhere. It is not just a case of a broader than usual tempo - that in itself lends the music a certain swagger and machismo - but, rather, the knife-edged precision of rhythm is somewhat lacking. Ensemble is occasionally slack and matters are not helped by the rather beefy and weighty recording, which masks some of the detail and blunts the impact of what should be a terrific curtain-raiser. Thankfully matters improve somewhat with the other two �show pieces�, Scapino and the Capriccio Burlesco. The former again is broader than the norm, but here the extra space allows rhythms to be pointed to a greater extent and certainly encourages a greater flexibility and expressivity - try the big cello theme. The Capriccio Burlesco is given an eminently satisfying performance with absolutely nothing to complain about; yet for extra sparkle just listen to the work�s first recording, conducted by André Kostelanetz (the dedicatee) with the NYPO to hear just what can be made of this music. The main work on the disc is the Sinfonia Concertante, given here in its (1943) revised version. This receives an outstanding performance; again, it is possible to envisage a sharper rhythmic profile, more driving tempi for the outer movements. Yet the opening echoes of Stravinsky come across vividly and the lyrical string writing is as expressive as could be wished for. Katin proves an admirable exponent of the �obbligato piano� part, projecting with clarity and precision without precluding expressive warmth. The central movement is exquisitely beautiful in places, the orchestra truly revelling in Walton�s typically wistful vein of lyricism; particularly lovely solo horn playing. Each movement was dedicated to one of the Sitwells - Walton�s friends and introduction to high society. The performance of the third movement certainly plays up to the near-quotations from Lambert�s The Rio Grande which set the poetry of Sacheverell Sitwell. Vilem Tausky�s extrapolation of four movements from Walton�s ballet The Quest receives another outstanding performance. It is a shame that Walton couldn�t have been persuaded - or the funding provided - to record the complete score as Bryden Thomson did for Chandos. However, the four excerpts here amply demonstrate Walton�s mastery of orchestration and his intuitive sense of drama. The opening storm music is played with great commitment, whilst the ensuing waltz associated with the magician�s spell swells and surges in a very Ravelian manner. The siciliana second movement deserves special mention, with its beguiling flute melody and characteristically bitter-sweet mood. It is a pity that the complete ballet did not stay long in the repertoire. The principal draw for Walton completists is certainly the 1940 Music for Children. This ten-movement suite, an orchestration of a set of piano duets written initially as a sequence of solos for the composer�s niece, is charming. However, these short movements - few lasting much more than a minute � are not top-drawer Walton and, as such, are not a required purchase. Some are based around five-finger exercises whilst others - such as �Puppet�s Dance� and �Ghosts� - are pleasingly illustrative. The performance is a delight, with little details here and there tellingly highlighted. All of the works on this disc - apart from the Music for Children - are better served elsewhere, although the couplings presented on this CD are unique. It is certainly a useful supplement to EMI�s classic recordings - now available on four mid-price collections in EMI�s British Composers series. It is worth mentioning, though, for those wanting to explore Walton�s oeuvre, that for the price of this single CD, Sony offer a two-disc set in their Essential Classics series (SB2K89934 review). There one can find Szell�s legendary recordings of the Second Symphony and Hindemith Variations, Kostelanetz�s electrifying Capriccio Burlesco and Johannesburg Festival, a fine Violin Concerto (Francescatti) and a block-buster of a Belshazzar under Ormandy complete with outrageously American accents.